We at homify feel it should be noted that the way we decorate our homes, much as the way we view art, is completely subjective. What is aesthetically pleasing to some is not necessarily so to another, as beauty indeed is in the eye of the beholder. But there are a few key mistakes you should take into consideration when decorating your home. As we go on to discuss the mistakes that should be avoided, we at homify don't intend to trivialize anyone’s personal taste or style. As we have learned, some decorating rules can and are meant to be broken! However, there are a few rules of thumb to be taken into consideration, and this is simply a guide to improve the look, feel, and flow of your space. Follow these simple tips, you'll know which mistakes to avoid when furnishing and you'll have a beautifully designed home in no time. People think that every item in their home has to match, and this simply isn't true. Many rooms benefit from the additional texture, design, and colour of other similar items, and a lot of beautifully designed homes have furniture items that are mismatched, so to speak. Take this living room, for example. Each piece of furniture differs slightly in style and colour. The love seat has a nice neutral grey and black colour scheme with full-bodied cushions and an accent pillow, while the chair is a popping, bright yellow. Based on this living room and styles like this, we advise furniture that differs in colour and pattern. You might even choose a piece of furniture with a pattern and one that’s a solid colour to spice things up a bit. 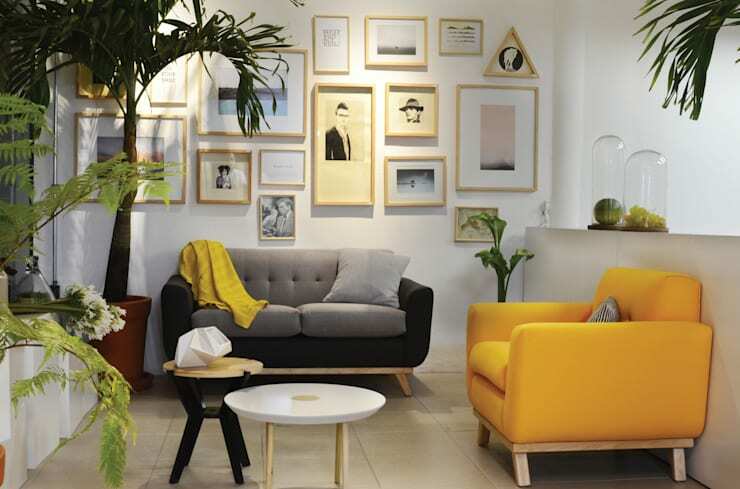 And to make other furnishings come together a bit more, simply add complementing colours to other pieces, like we see with the yellow blanket on the love seat. When extra patterns and colours are brought in, a rooms gains range and magnitude. What would a breathtaking room be without one, two, or more pieces of artwork In fact, without art, the world itself would be rather boring. 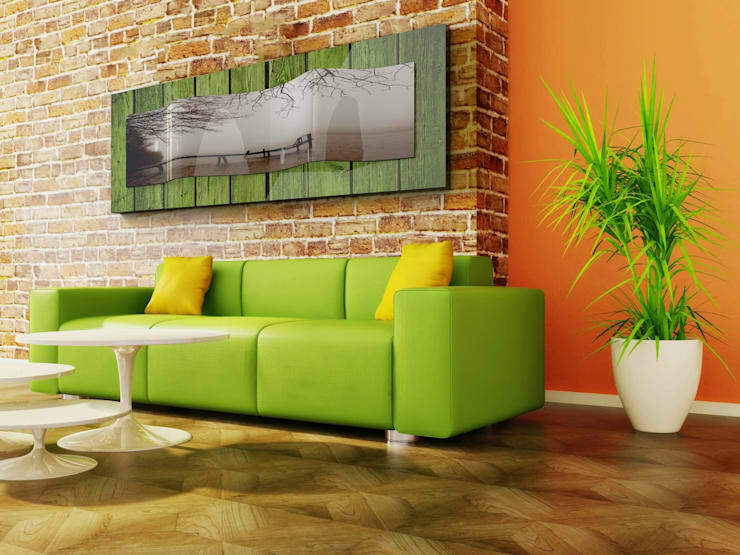 This gorgeous retro style living room would seem rather bare without the artwork hanging above the couch, and the repeating green colour from the art and the couch increases the artwork's impact in the room. Without the complement of the green couch, the art wouldn't feel quite as strong. Try it! Put your finger just over the pillows in the picture. Placement of your art is also important. This painting would look okay on the wall all by itself, but the couch underneath the painting and gives it emphasis – it's the same as underlining or highlighting something in a sentence. Integrating multiple works of art by the same artist or works that are very similar in style creates an even greater effect. Proper lighting is essential in every room, as lighting is perhaps one of the most important elements in our homes. Natural lighting changes throughout the day and even throughout the seasons, and weather can also impact the lighting in a room. One thing you can consider when thinking about lighting are dimmers. There are times when we want and need our rooms to be brightly lit, and there are times when we want those lights not to be so glaring and strident, like at the end of the day, or when you want to create a relaxing, friendlier, or intimate atmosphere such as when you are entertaining guests. Additional light can be layered in with ceiling fixtures, and we're not talking about that gorgeous chandelier. We mean the small, linear lights fixed into the ceiling. These lights illuminate the wall and make the dining room look much larger. Also, the addition of lamps on desks, tables, or near sofas are great ways to add more flair. Be careful, though, when working with lamps and think about their size. Lamps that are too small look a bit out of balance, and most importantly you won't get adequate light for your space. Again, matching every single detail in your home is so completely unnecessary, we can't stress this enough! So mixing and matching materials and colours will give you the best design for your space. Take this living room as a prime example of how you can mix colours effectively. 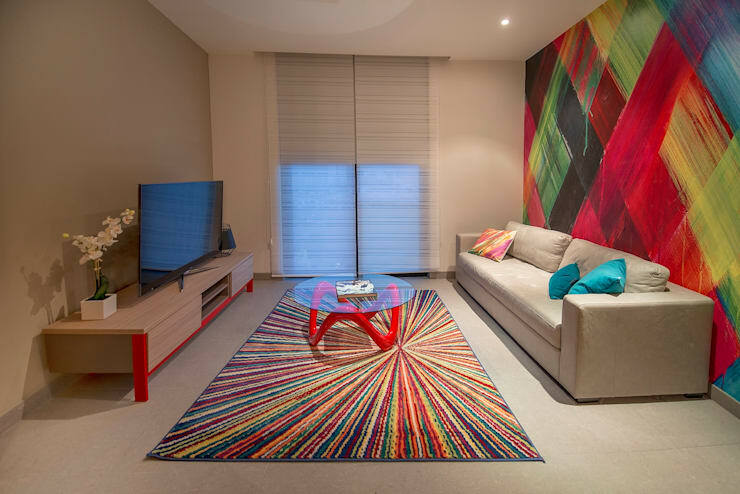 You wouldn't think that the rainbow, star patterned rug in the centre of the room would match so well with multicoloured diamond pattern on the wall, but as you can see, this room pulls it off with ease. It doesn't matter that the design on each differs, because selecting a large-scale print with several colours will give you multiple options for mixing and matching. These bold designs even match with the accent pillows on the sofa, as well as the red legs of the coffee table and television stand. Also, each pattern you choose for your space should be distinct from the others, but not so much that it overwhelms the space. When deciding where each pattern fits into the room's design scheme, pull the colour to the centre. Don't use a large scale pattern on the walls or the room will look too busy. Everything from colour to furniture trends can help you create a space that perfectly coordinates with your personality. There are always the classic home design choices you could make, but don't be afraid of those bold, new trends. Take this stunning living room, for example. Wallpaper is back in style and back with a vengeance. The use of wallpaper in this room really makes the space look unique and as if it's continuing on. Sure, white walls are easy on the eyes, but when you have the opportunity to try a different colour, or a different texture, go for it! The right colour can help you bring personality to your newly renovated living space. If you’re afraid of bold hues, try testing the waters with pillows instead, like we see here with the strategically placed red accent pillows. Introducing bright colours through decorative items first can give you an idea of what the hue will look like throughout the room. Do you ever walk into a room and immediately recognize how much it reflects its occupant? Painting away dull white walls is definitely a way to put a little colour into your life, but there is another, more imaginative option. Decorating your home with wall decals is a creative way to upgrade up any living space and showcase a bit of your personality to it. Taking risks in home decorating can pay off immensely when you allow your home to exhibit your individuality and style. This bedroom uses a quote as a decal option, so consider putting up your favourite inspirational quotes on the wall. When designing your space, you also need to figure out how you want it to feel to you and others when they walk in. If you want your house to feel happy and light and airy, like the first day of spring, incorporate some nice light pastel colours, like we see here. Do you have anything to add to help others avoid furnishing mistakes? We'd love to hear from you in the comments section below!